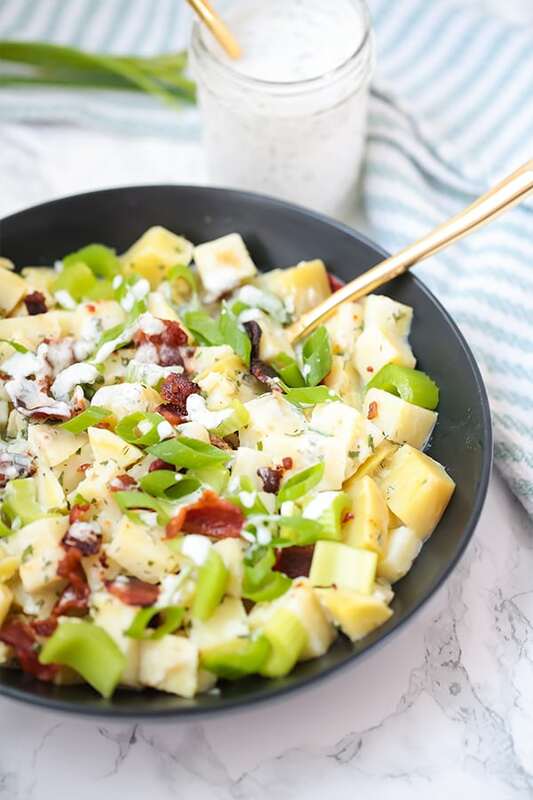 This bacon ranch sweet potato salad is the perfect summertime side dish! Serve it at picnics, barbecues, or just for a weeknight dinner. It’s paleo, AIP, and Whole30. Cold potato salad is such a classic this time of year. I don’t think I can picture summer without it… until I wound up having to go nightshade free and ditch potatoes. Not only did that cut out endless other potato possibilities at the time, but the potato salad was completely off the table. I just couldn’t see myself having a potato salad without the star ingredient! However, once I discovered white sweet potatoes, I knew that sweet potato salad that could fool any regular potato eater was possible. And that’s where this Bacon Ranch Sweet Potato Salad was born! 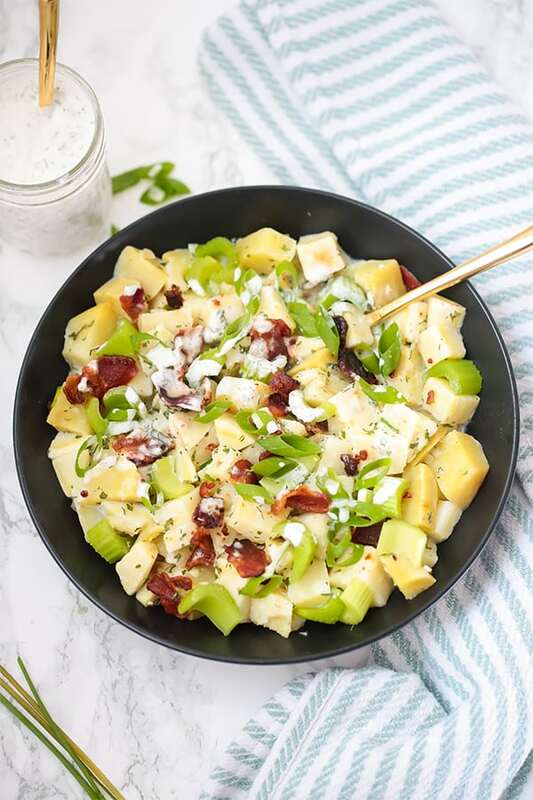 Bacon and ranch is always a killer flavor combination, and it really shines in this potato salad. All of the ingredients are nutrient dense, homemade, and completely packed with flavor! Something like Japanese Sweet Potato or Hannah Sweet Potato would work best for this recipe. I find both of these varieties at Natural Grocers and Whole Foods. They have great flavor and texture and are create the best potato salad look. However, if you can’t find white sweet potatoes, you can sub orange. This is a more non-traditional potato salad ingredient, but it really gives the salad some extra crunch and freshness! Wouldn’t be a bacon ranch potato salad without the bacon, right? Oh yeah, we’re doing this the right way! 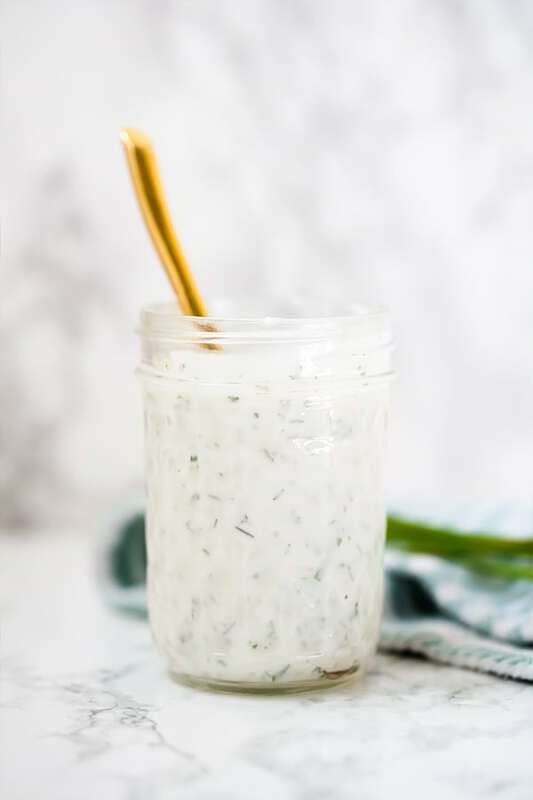 If you tolerate store bought ranch like Primal Kitchen, go for it, but with just a few extra steps, you can have delicious homemade ranch for this salad. The main ingredients are mayo, coconut milk, parsley, dill, chives, onion, garlic, and apple cider vinegar. Combine all of the ingredients for the ranch in a large glass jar and blend with an immersion blender until smooth. Set aside in the fridge. Bring a large pot filled two-thirds of the way with water to a low boil over medium heat on a stove top. Add the white sweet potato and cook for 10-15 minutes or until the sweet potato can be easily pierced with a fork. Carefully strain the excess water with a colander and allow the sweet potato to cool completely. Pat dry if needed, and chill for 20-30 minutes in the fridge. Using a large bowl, combine the sweet potato, celery, bacon, and green onion and carefully mix with the ranch, adding 1/4 a cup at a time. Serve chilled with extra ranch on the side. Like this recipe? Check these out!! I keep reminding myself to write my appreciation for your professional, easy-to-use site, and the amazing gifts of incredible recipes that you give away. You breathe magic back into the desert of my food restrictions. So instead of feeling glum and not excited at all about what’s available, you come up with these incredible recipes and absolutely rock my world. So this is for all the amazing recipes you gift me with: kudos and so much appreciation to you! This looks so delicious! Can you recommend a substitute for the celery? I usually just omit it but it seems like it adds a lot to this recipe. Thank you! Hm.. maybe you can use fresh onion to get some crunch? We made this yesterday and it’s so good! It was a hit for our family and friends! Thank you! Came across your site on Pinterest. AIP newbie here and am thrilled to see these recipes!!!! !